how to train your dragon | Cappa Toons! I’ve always liked Chris Sanders as an artist, but I have never been a huge fan of his films. I like them, I’m just not flat out in love with them or anything. Lilo and Stitch is a good film. But I don’t always know whether its done any justice being under the Disney label. It’s a little weird, which is fun, but I feel like it could have unleashed so much more, which just ends up making it moderately enjoyable. As for How To Train Your Dragon, again, it’s a good movie. But my feeling is that the film is a little too on the nose with it’s subject matter. It’s kind of “Dragons 101” for anyone who wants to know more about their dragon. In some ways, I almost wish it could have been a little less obvious. For instance, I kind of wanted to see some boys with some girl dragons and vise versa, not simply seeing the dragons mimic everything about the characters personalities. Part of the thing is seeing the dragons tell us aspects about the human character we don’t see on the surface. We get some aspects of that in the film. But overall the concept just didn’t blow me over. Which leads me to The Croods. I didn’t expect too much out of the film, at least at first. But ever so slowly it started to grow on me. I was amused at the funny introduction where the characters would “hunt” in what ended up being a kind of prehistoric football game with the whole family trying to work together to get an egg from a massive prehistoric bird. I was a little worried at first because the main characters Eep and Grug seemed like yet another angsty teenage daughter story dealing with an overbearing father, which is so commonplace in animated films. The one thing that was different about this film though, was the movie turned out to be more about Grug going on a journey to overcome his reliance on fear to stay alive. I have to say that once the film got underway and the characters started off on their adventure, I completely fell in love with The Croods. There is just incredible imagination at work here, with the wonderful and whimsical character designs for the creatures that inhabit this world. The funny thing is that the monsters are so cute and equally terrifying at the same time! Not terrifying in a way that’s going to frighten children, but they’re enough of a threat to keep you going with the characters, as they search for this uncharted world called “To Morrow”. The main reason this movie worked so well on me was the simpleness and uncomplicated nature of the story. It’s very lighthearted and fast paced. While I was left concerned for the characters safety, I never felt that we really needed to see any of the characters die to make this more engaging. It never loses its sense of fun and it never takes itself too seriously. It gently seems to poke fun at the overused father/daughter storylines we keep seeing in animated films, where Grug basically enforces that anything fun, anything that leads to curiosity leads to DEATH! I didn’t think I was going to like Nicholas Cage being the voice for an animated character and didn’t believe his voice would be too monotone for animation. I was wrong, and he does a wonderful job bringing Grug to life as a character, and between the voice work and the animation, he becomes a great, emotional, and well rounded character. All the characters in The Croods are a joy to watch. I loved Guy, the cave man who gets all the ideas, and introduces them to fire. Grugs scenes are also hilarious when he tries to be like Guy and come up with inventions of his own, including “shades”, and then his invention of the “snapshot”, by covering his face in mud, then slamming his face against a rock for the imprint. Every character has their moment. 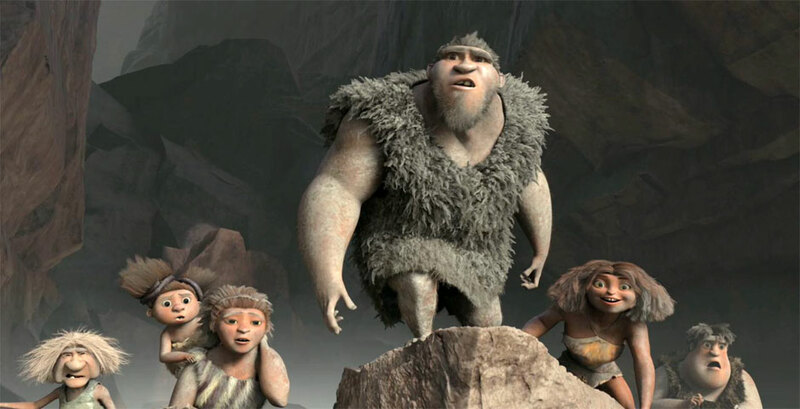 What I also loved about The Croods as a family is that they are just hilariously weird and completely zany at times, partially due to the fact that they’re one of the only families left on the face of the earth. The only character I wish had more development was Grug’s wife Ugga, who is played just a little too straight. I almost wish there could have been room to give her some more zany attitude and fun like the rest of the family, but part of the problem too is that she kind of fades into the background at times. Part of the adventure of the film is how the family slowly but surly steps away from Grugs over protective way of life and starts discovering new ways of living in this uncharted world. Living in caves finally starts becoming unappealing to them, much to Grugs frustrations. One of my favorite scenes in the movie was where the family gets split up in a canyon and everyone has to find their way out and come up with their own creative method to survive. Everyone succeeds, except Grug, who is trapped and can’t get through based on his reliance of fear. It’s not until the final scene, where Grug is ultimately tested when left alone to his own devices, he makes the flight to free himself. 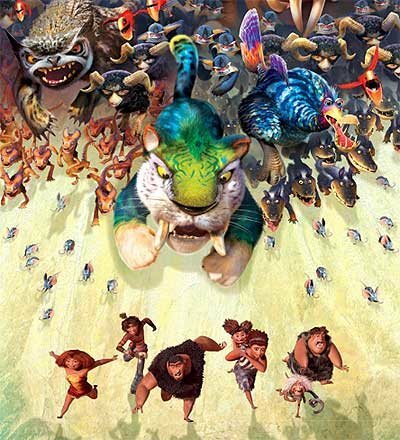 One of the characters that stalks The Croods is a large Saber-tooth cat. The cat is funny while also being a good threat to our heroes. But the best scene in the film is towards the climax, where Grug is left alone and the cat stalks him in the caves. Grug runs for his life holding a torch and being chased by the cat. At one point the torch goes out leaving him in pitch blackness, and Grug blows frantically on the torch to get the flame back. As the flame comes back, we also see the cat blowing on the flame trying to get it back as well! The cat is afraid of the dark! I died laughing at this moment because it became clear to me what the Saber-tooth cat was for Grug. The cat is Grug’s dragon. In this sudden twist, the two of them find each other, and the cat whose been chasing him the entire movie, no longer wants to chase him and doesn’t want to be alone in the dark. Like Grug. It was just a lovely, sweet moment. The movie almost never deviates from its light comical tone. In some ways the movie kind of reminded me a bit of The Emperor’s New Groove, a movie that also isn’t meant to be taken seriously by any means. It’s great to see cartoons like this, because a lot of times when the story gets heavy handed and serious, it looses its focus as a cartoon and loses its spirit of fun that we just want to embrace with certain films. I just wanted more of the zany fun that The Croods provided, and it rarely ever lets itself get dragged down with heavy story material. What helps too is that the story was co-written by Monty Python genius John Cleese, and once I found that out at the end credits, I could see the Pythonesque humor scattered all over the film. The Croods is a joy to watch, and one of my very favorite animated films to come out in a long time. I have to say that this is probably my favorite of all Chris Sanders films, because it’s a chance to see his weird side completely unleashed. The animation is terrific, the visuals are stunning, and overall, this is just a really really fun film. By all means, go see it while its still in a theater! New Page Added: Cartoon Murals! A brand new gallery has been added to my website. Now you can see all the cartoon animation murals I’ve done in the past. Check them out here! Or click on the Carton Murals link on the header bar.